Browse our bamboo wind chimes which are displayed in two separate collections: those with plain chimes and those which are decorated. We offer free UK delivery on everything. 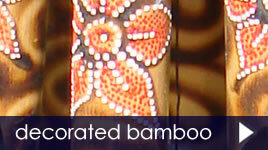 Painted flowers, sunbursts, swirly patterns or stripes as displayed on the striking Tiger bamboo chime. 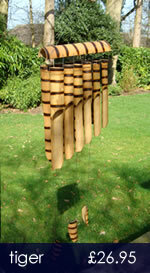 You'll also find some items with coloured bamboo chimes. Choose from a variety of designs and sizes: from little Jambi. which features a coconut top and 6 cut bamboo chimes, to the magnificent Serengeti - 12 cut chimes supported by a section of giant bamboo. 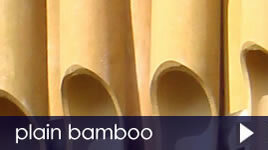 Bamboo chimes generally produce muted tones; the larger the diameter of the chime, the deeper the tone. They do not resonate like metal chimes do, so if you are concerned about disturbing your neighbours, a bamboo chime is a good choice!